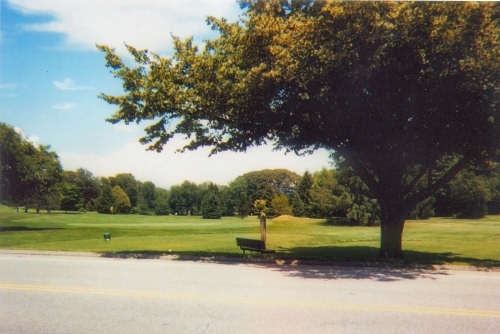 The South Portland Municipal Public Golf Course was created by golf pro Lawrence Vincent "Larry" Rowe (1898-1976) in 1931. It is a popular nine-hole course today that caters to many amateur and beginner golfers. Larry Rowe, a native of Portland and the grandson of Irish immigrants who came to Nova Scotia, was introduced to golf at an early age when his parents moved to South Portland in 1906. The Portland Country Club was situated at nearby Thornton Heights at the time and Larry learned the game here. He became a caddy and later an instructor for the Portland County Club and was also a clerk for the George B. Donnelly shipping firm. He spent two months in the U. S. Army during the end of World War I. In the mid-1920s Larry was a teacher at Alex Chisholm's golf school on Federal Street. Chisholm was a famous Maine golfer. In 1930-1931, Larry created his own golf course on his father's land on Westbrook Street. He would own, operate, and manage the course for the next forty years before retiring in 1970. At some point he constructed a stucco-style home that you now see on Westbrook Street, just below the old homestead of his parents. Several generations of Portland and South Portland boys, especially Irish boys from the city, caddied for Larry at his course, including his young cousin Tom Gillan who remarked that Larry's father monitored everything with hawk eyes. Nelson Harmon remembers working at the course in the 1940s as a caddy and then as a greens keeper. He mowed the greens with a Model A Ford tractor, pulling three Worthington fairway mowers behind him (see www.southportland.org). Brothers Joe and Jim Lynch of Portland fondly recall caddying at the course in the early 1950s when they could sometimes make $1.25 a day; the amount made depended on which class of caddying they did: A, B, or C (which in itself depended on the skill and ability of the caddy). Jim Lynch said Larry was "a nice guy" who created his own golf cart. Larry Rowe was at the top of his game in the 1930s and 1940s. For many years, James J. Fitzpatrick was the golf pro and instructor at Larry's course. In 1936, with Fitzy at Rowe's and Larry himself the golf pro at Purpooduck Country Club (Cape Elizabeth), the two gave a "terrific shellacking" to their respective links (see "Fitzy and Rowe Burn Up Links, Portland Sunday Telegram, 14 Jun 1936). While the golf pro at Purpooduck, Larry won the Maine Golf Open in 1937. According to a recent news article, Larry designed the front nine at Purpooduck and was the club's first pro, a position he held from 1925 to 1941 (see Chard: Maine Golf Hall making effort to appreciate historic figures, tchard@mainetoday.com). Larry taught golf in Maine, Indiana, Florida, and Massachusetts. He was a life member of the national Professional Golfers' Association and a former member of Portland County Club and Webhannet Golf Club in Kennebunk. Larry's professional posts included Belleair and the former Jungle and Shore Acres Golf Club, Pinellas County, Florida. He wintered in that state for thirty-four years. When his brother Raymond died in 1948, Larry continued to own and operate Rowe Motors, Westbrook, and also owned the Lincoln-Mercury auto dealership in Saco with his sister Dorothy Beach. Larry sold the golf course to the City of South Portland, who opened up the municipal course in 1974. He also instructed his attorney (and cousin) Tom Gillan that he was selling off all his property locally and moving permanently to Florida. He died in St. Petersburg in March 1976 and is buried with his wife, the former Mary Katherine Gately of Portland, in Calvary Cemetery, South Portland. A movement is underway, spearheaded by Jim O'Connor of South Portland and Purpooduck Club's unofficial historian, to have Larry Rowe inducted into the Maine Golf Hall of Fame in 2011 (see www.mainegolfhalloffame.com). Views 418 views. Averaging 1 view per day.